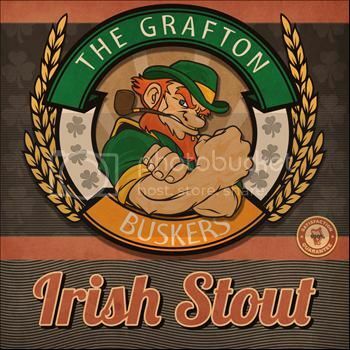 This is a one-off music review; I was offered the chance to review Irish Stout - 100% Proof by The Grafton Street Buskers as part of a St. Patrick's Day celebration. I have a fair number of Irish relatives on my Mum's side of the family. Unfortunately, we only really get together at funerals. I've been to a number of funerals, but it's only when my Irish family are around can I say that it's actually a really joyfull day, full of smiles and laughter - and this is when it comes to the wake. Of course, I never like it when anyone dies, but I love how the Irish - or at least my Irish relatives - hold a wake, which includes a good sing song. They're the only people I know who can sing - without music - without the slightest hint of embarrassment or worry about their voice. And it's always so beautiful. It's through these wakes that I have had my traditional Irish songs education. I don't know many, but I know a few! Plus that wonderful Irish bar chain, O'Neill's always has traditional Irish songs playing. I love them! So I was more than happy to review this album. There were a number of songs on this album I recognised, such as The Wild Rover and Tell Me Ma, that sounded like jazzy, faster versions, like they were playing at the wrong speed and the singers sang faster to keep up. Even some of the songs I didn't recognise sounded too fast, just from what I know of traditional Irish music. Despite this, they were still enjoyable. I especially liked Danny Boy, which is a song my Great Nan (my Grandad's Mother) used to sing. According to my Mum, this version is a much slower than this sony normally is, but I've never heard it with music, I've only hear my Nan sing it. I don't know the words to Danny Boy, but this version sounds so melancholic which suits my memory - that of my Nan singing at a wake, but also of her now she is dead. I found myself quite emotional when listening to it. I also really loved Drunken Sailors and Toss the Feathers, which are instrumentals. They put me much in mind of the movie Titanic, where Jack takes Rose to the party of the lower classes, and the music they dance too. It's fun and catchy, and I couldn't help bouncing along to it in my seat. The Fields of Athenry, although not instrumental, is just as fun! There were quite a few surprises that I wasn't expecting at all. The Grafton Street Buskers cover some popular songs, giving them a traditional Irish sound. The songs covered are Lady Gaga's Poker Face, Outkast's Hey Ya, U2's Beautiful Day and Thin Lizzy's The Boys Are Back in Town. I am still undecided about whether or not I like these covers, as I'm so used to the original's, it's odd to hear them with the Irish spin. But it's interesting to hear them! Over all, an awesome album that takes traditional Irish songs and gives them a new edge, and popular songs with an Irish spin. If you like traditional Irish music, this is definitely an album to add to your iPod. Thank you to The Eighty Sixth Floor for a review copy.